I switched cable providers recently. When I moved in, there was only one provider to choose from. It seems when they built the building, they entered into a contract with this provider and everything was wired up for them. However, that deal was a two year contract, and now two years have passed, so back to the free(ish) market! Unfortunately, this also made me a first mover. So, long story short, it took this poor technician 5 hours to install my new service. Lots of lessons learned for the next person. While this guy was drilling holes in my walls and neatly running cables from point A to B, I had nothing to do. This called for a fridge clean out. I am one person, but I seemed to have accumulated quite a bit of living ecosystems cultivating in jars in the back of my fridge. I meticulously (the Sylvia definition) took everything out, and cleaned each and every shelf. I threw out a lot of mystery jars and containers. In doing this, I did find a container and a block of cream cheese from the last time I must have made cake. Going by my wisdom that cream cheese goes bad when it turns color, this half used container looked still good. But I suspect it wouldn’t last that way for long. So, now starts the race to use up the cream cheese! Now that we are in the midst of a heatwave, baking anything was out of the question. Plus I really didn’t want any dessert lying around taunting me to eat it all by myself. So I searched the internet for some ideas. That’s when I came across some comments talking about peanut butter and cream cheese sandwiches. What? Really? I had to give this a shot. It was actually pretty good. 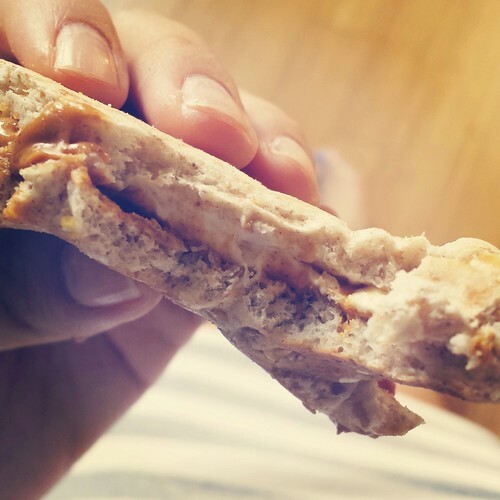 I love cream cheese and the tang, and with the peanut butter, it worked! Someone equated it to a tangier version of peanut butter and fluff. It was not. They are similar only in color profile. The cream cheese was silkier and didn’t have to sweetness that makes fluffernutter sandwiches so yummy. This was definitely not sweet, but just as satisfying. I’m already looking forward to the next opportunity to make another! What else can I do with cream cheese…. 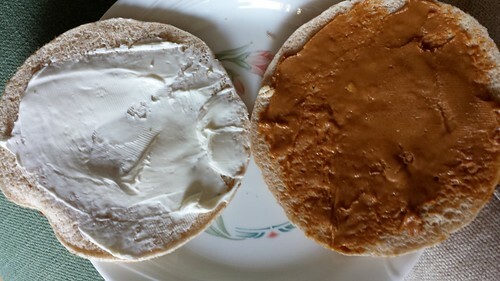 This entry was posted in cheese, Dinner, Sandwich, Uncategorized and tagged cream cheese, Peanut butter, Sandwiches. Bookmark the permalink.